The rising incidence of autoimmune diseases such as multiple sclerosis (MS) in developed countries might be due to a more hygienic environment, particularly during early life. To investigate this concept, we developed a model of neonatal exposure to a common pathogen-associated molecular pattern, LPS, and determined its impact on experimental autoimmune encephalomyelitis (EAE). Mice exposed to LPS at 2 wk of age showed a delayed onset and diminished severity of myelin oligodendrocyte glycoprotein (MOG)-induced EAE, induced at 12 wk, compared with vehicle-exposed animals. Spinal cord transcript levels of CD3ε and F4/80 were lower in LPS- compared with PBS-exposed EAE animals with increased IL-10 levels in the LPS-exposed group. Splenic CD11c+ cells from LPS-exposed animals exhibited reduced MHC class II and CD83 expression but increased levels of CD80 and CD86 both before and during EAE. MOG-treated APC from LPS-exposed animals stimulated less T lymphocyte proliferation but increased expansion of CD4+FoxP3+ T cells compared with APC from PBS-exposed animals. Neuropathological studies disclosed reduced myelin and axonal loss in spinal cords from LPS-exposed compared with PBS-exposed animals with EAE, and this neuroprotective effect was associated with an increased number of CD3+FoxP3+ immunoreactive cells. Analyses of human brain tissue revealed that FoxP3 expression was detected in lymphocytes, albeit reduced in MS compared with non-MS patients’ brains. These findings support the concept of early-life microbial exposure influencing the generation of neuroprotective regulatory T cells and may provide insights into new immunotherapeutic strategies for MS. In the industrialized world, autoimmune disease incidence has increased over the past century, especially for diseases such as multiple sclerosis (MS)4 (1). Factors that coincide with these epidemiological findings include the improved health of increasingly prosperous populations and the relative reduction of infections compared with less-developed countries (1). These observations have led to the emergence of the “hygiene hypothesis,” which posits that exposure to infectious or environmental agents diminishes the subsequent risk of atopic and autoimmune disease (2, 3). The mechanisms underlying this well-recognized phenomenon remain unknown. Although MS has been associated with individual pathogens, it is held to be an autoimmune disease that is influenced by environmental (and genetic) factors. Indeed, helminth infections seem to reduce the risk of relapses in MS (4) and are also protective during experimental autoimmune encephalomyelitis (EAE), the principal model for MS (5, 6, 7). More subtle exposures to environmental microbes also appear to influence disease outcomes in various rodent autoimmune disease models. For example, animals housed in specific pathogen-free facilities vs conventional facilities appear to develop more severe EAE (8). However, this phenomenon is in contrast to myelin basic protein (MBP) TCR-transgenic animals, which develop spontaneous EAE under conventional but not specific pathogen-free conditions (9). It has been suggested that these immune perturbations act by skewing T cell development toward a TH2 phenotype or away from a pathogenic immune phenotype, leading to a reduction in disease severity through either a shift in the predominant cytokine milieu or lineage-specific functional differences in the T cells. This hypothesis of skewing between multiple “effector” T cell lineages, however, does not explain the positively correlated relationship between autoimmune disease (TH1, TH17) and atopy (generally TH2) (1). In recent years, there has been a marked increase in our understanding of the function of regulatory T cell lineages as pivotal negative regulators of adaptive immune responses (10). Hence, it is plausible that immunomodulatory treatments, more or less hygienic living conditions, and concurrent infections that are protective in EAE may additionally function through an alteration in the balance between the development of regulatory (Treg) and effector (Teff) T cell lineages (11). Innate immunity relies on the capability of recognizing molecular patterns associated with danger or infection, usually representing the first encounter between the host immune system and an exogenous agent (12). These patterns are recognized through a series of evolutionarily well-conserved innate immune receptors such as the TLR family. Signals induced through these receptors can act not only as beacons for the presence of danger but also as a molecular signature for identifying the nature of an immune insult (13). Dendritic cells (DCs) are professional APCs, which act as an interface between the innate and adaptive immune systems (12). Ultimately, T lymphocyte activation and lineage selection result from the combination of activating and inhibitory receptor-ligand interactions between DC and T cells at the level of the immune synapse, along with signals provided by the local cytokine milieu (14). By modulating their cell surface phenotype and cytokine production in response to signals from pattern recognition receptors, DCs can direct the outcome of T cell activation to a specific challenge. In response to subthreshold signals of danger or perturbation of the APC phenotype, T cell activation by the DC might not occur or may result in a tolerogenic response. Although several lines of evidence indicate that microbial exposure might exert tolerogenic effects on the immune system, it is clear that timing is crucial, acute intercurrent infections or disease often exacerbate autoimmune disorders including MS (15). This latter outcome might occur due to nonspecific activation of cytokine expression by cells in the context of an actively mounted anti-self-response. Microbial exposures during times of relative immune senescence may also be more or less protective depending on when in life they occur. In support of this point, a recent study of migrants from the French West Indies to mainland France demonstrated an increased risk of developing MS if relocation occurred before the age of 15 compared with later in life, although either case was associated with a significantly higher probability of developing disease (16). Despite mounting evidence in support of the hygiene hypothesis, it remains difficult to prove but exploration of this hypothesis might lead to improved strategies for preventing and treating autoimmune diseases. In this study, we hypothesized that early life exposure to an exogenous pathogen-associated molecular pattern might influence the development of neurological disability caused by EAE by modulating the APC phenotype and ensuing anti-MOG T cell response. Phenotypic characterization of CD11c+ DCs elucidated a specific molecular profile associated with LPS-mediated neuroprotection, defined by lower levels of MHC class II (MHC II) and CD83 but increased CD80 and CD86, and APCs with this phenotype selectively induced greater proliferation of FoxP3+ T lymphocytes compared with controls. Animals exposed to LPS as neonates displayed induction of IL-10 within the CNS, and there was a robust inverse correlation between disease severity and the frequency of CNS-infiltrating FoxP3+ T lymphocytes. These observations were supported by reduced FoxP3 expression in brain tissue from MS patients compared with non-MS patients. C57BL/6 pregnant mice (matched gestation) were obtained from The Jackson Laboratory and maintained in the Health Sciences Laboratory Animal Services facility of the University of Alberta under conventional housing conditions. Two weeks after birth, pups were injected i.p. with 1 mg/kg LPS 0111:B4 (L2630; Sigma-Aldrich) or PBS as a vehicle control. This time point was chosen based on studies in rats which defined an early life “window” during which endotoxin exposure was able to markedly influence adult febrile responses to LPS (17). EAE was induced in 12-wk-old animals by s.c. injection of 50 μg of MOG (MOG35–55 peptide, prepared by the Peptide Synthesis Facility, University of Calgary) emulsified in 100 μl of CFA (Sigma-Aldrich) (18). Mice were also injected i.p. with 300 ng of pertussis toxin (Sigma-Aldrich) in 200 μl of PBS on the day of immunization and 2 days later (18, 19). Control animals received only CFA without MOG35–55 peptide and pertussis toxin. Animals were assessed daily for disease severity for up to 30 days following immunization using a 0- to 15-point scoring scale (20). All experiments were approved by the University of Alberta Animal Care Committee. Spinal cords were removed from euthanized animals and processed as reported previously (19). Four-micrometer sections were stained by hematoxylin or Bielschowsky’s silver impregnation and the axonal number was quantified. Three randomly chosen fields in white matter from each spinal cord section were scanned to provide digital images and quantitative analysis of axonal numbers per mm2 was performed as described previously (19). Double immunostaining was performed using FITC-conjugated goat anti-rabbit secondary Ab (1/500 dilution; Serotec) or Alexa Fluor 488-conjugated goat anti-rabbit secondary Ab (1/500 dilution; Molecular Probes) to detect the Iba-1 Ab (1/100 dilution; Wako) and Cy3-conjugated goat anti-rabbit secondary Ab (1/:500 dilution; Jackson ImmunoResearch Laboratories) to detect the CD3ε Ab (1/50 dilution; Santa Cruz Biotechnology). Deparaffinized sections were preincubated with 10% normal goat serum/2% BSA (for Iba-1) or 5% horse serum/5% donkey serum/2% mouse serum/2% BSA/0.2% Triton X-100 (for Iba-1/MBP) overnight at 4°C to prevent nonspecific binding. Cy5-conjugated goat anti-mouse secondary Ab (1/500 dilution; Jackson ImmunoResearch Laboratories) was used to detect the mouse monoclonal MBP (1/1000 dilution; Sternberger Monoclonals) or FoxP3 (FJK-16S, 1/100; eBioscience). Ag retrieval was performed as described previously (19). Specificity of staining was confirmed by omitting the primary Ab. Three randomly chosen fields in white matter tracts from each spinal cord section were scanned by a Zeiss Laser Scanning System (LSM 510). The quantitative analysis of Iba-1, CD3, and FoxP3 cell counts per mm2 was performed as described previously. An examiner who was unaware of the slide identity calculated the percentage of MBP-positive areas in the white matter of spinal cords, and quantitative analysis was performed by using Adobe Photoshop and the public domain program Image J (National Institutes of Health, Bethesda, MD) (21). To purify DCs, magnetic separations with a mouse CD11c+ selection kit were performed according to the manufacturer’s protocols (StemCell Technologies). Briefly, splenocytes were prepared by collagenase/DNase I digestion of finely minced spleens and Fc receptors were blocked by addition of an anti-CD16/32 mAb (clone 93; eBioscience). Cells were labeled with PE-labeled CD11c-directed Abs, conjugated to magnetic nanoparticles, and separated in a magnetic field. Resulting purified cells were routinely greater than 87% CD11c+. For T cell isolation, a mouse T cell-negative selection kit was used according to the manufacturer’s protocols (StemCell Technologies). Purified cells were routinely greater than 90% CD3+. To quantify total T lymphocyte proliferation driven by DCs isolated from LPS- or PBS-exposed mice, DC-T cell cocultures were established. Briefly, DCs isolated from mice exposed to PBS or LPS as neonates were mitotically arrested by treatment for 30 min at 37°C with 50 μg/ml mitomycin C (Sigma-Aldrich). In brief, 104 DCs/well of 96-well round-bottom plates were cocultured in the presence or absence of 20 μg/ml MOG35–55 peptide with 105 T cells isolated from the spleens and inguinal lymph nodes of MOG-immunized mice. After 60 h of incubation, 1 μCi/well [methyl-3H]thymidine (GE Healthcare) was added for another 12 h. Cells were harvested onto filter mats using a cell harvester (Harvester 96; Tomtec) and counted in a microbeta scintillation counter (PerkinElmer). Data are presented as (cpm from MOG-containing wells) − (cpm from no-MOG control wells). For flow cytometric analysis of total splenocytes from EAE animals cultured in the presence or absence of MOG35–55, 2 × 105 splenocytes were seeded per well of a 96-well plate in a final volume of 200 μl of enriched DMEM (DMEM supplemented with 2 mM l-glutamine, 1 mM sodium pyruvate, 0.1 mM nonessential amino acids, 100 U/ml penicillin, 0.1 mg/ml streptomycin, 50 μM 2-ME, and 10% FBS) with or without 20 μg/ml MOG35–55 peptide and incubated at 37°C with 5% CO2 until staining was performed. Splenocytes or purified DCs from LPS- or PBS-exposed animals were also assayed for Ag presentation ability using T cells pooled from LPS- or PBS-exposed EAE mice as responders. For these assays, splenocytes or purified CD11c+ DCs were arrested with mitomycin C and 2 × 105 splenocytes or 104 DCs/well were seeded in 96-well U-bottom plates with 105 purified T cells, with or without 20 μg/ml MOG35–55 peptide, in a final volume of 200 μl of E-DMEM and incubated at 37°C and 5% CO2 until staining was performed. Responder T cells were labeled with 1–2 μM CFSE (Invitrogen) to facilitate tracking of proliferated cells by flow cytometry. For analysis of DC surface phenotype, purified CD11c+ cells were surface stained with fluorochrome-conjugated Abs recognizing CD80 (16-10A1), CD86 (GL1), and MHC II (M5/114.15.2), or CD83 (Michel-17). For T cell analysis, fluorochrome-conjugated Abs recognizing CD3ε (145-2C11; BD Biosciences), CD4 (RM4-5), CD8b (H35-17.2), IFN-γ (XMG1.2), IL-17A (eBio17B7), and FoxP3 (FJK-16s) were used. All Abs were obtained from eBioscience unless stated otherwise and used at the manufacturer’s recommended concentrations. For intracellular staining, after the specified culture period, 10 ng/ml PMA (Sigma-Aldrich) and 1 μg/ml ionomycin (Sigma-Aldrich) were added to each well and cells were incubated at 37°C and 5% CO2 for 2 h. In brief, 3 μg/ml brefeldin A (Sigma-Aldrich; for IFN γ staining) or 1 μl/well GolgiStop (BD Biosciences; for IL-17 staining) was then added for another 2–3 h of incubation, cells were harvested, washed with PBS, and stained for surface and intracellular markers. For intracellular staining, the FoxP3 staining buffer set (eBioscience) was used according to manufacturer-supplied protocols. Dead cell exclusion was performed using the Aqua Live/Dead fixable staining kit (Invitrogen). Stained cells were analyzed on a BD FACSCanto, FACSCanto II, or FACSAria flow cytometer using FACSDiva software for acquisition. Multicolor compensation was performed using BD Biosciences Compbeads to prepare single-color controls. Cytometry data were analyzed using FlowJo version 7.2.2 (Tree Star software). Mouse tissues or cultured cells were homogenized in TRIzol (Invitrogen) and total RNA was purified from the aqueous phase using RNeasy mini columns (Qiagen). Following treatment of RNA with DNase I (Promega), cDNA was prepared by anchored oligo(dT) (d(T18)VN)-primed reverse transcription of equal quantities of RNA using either Superscript II or Superscript III reverse transcriptase (Invitrogen) according to the manufacturer’s recommended protocols. Semiquantitative real-time PCR was performed using Bio-Rad iQ SYBR green supermix (Bio-Rad) on either an iQ5 or an iCycler (Bio-Rad Laboratories) according to the manufacturer’s recommended protocols. 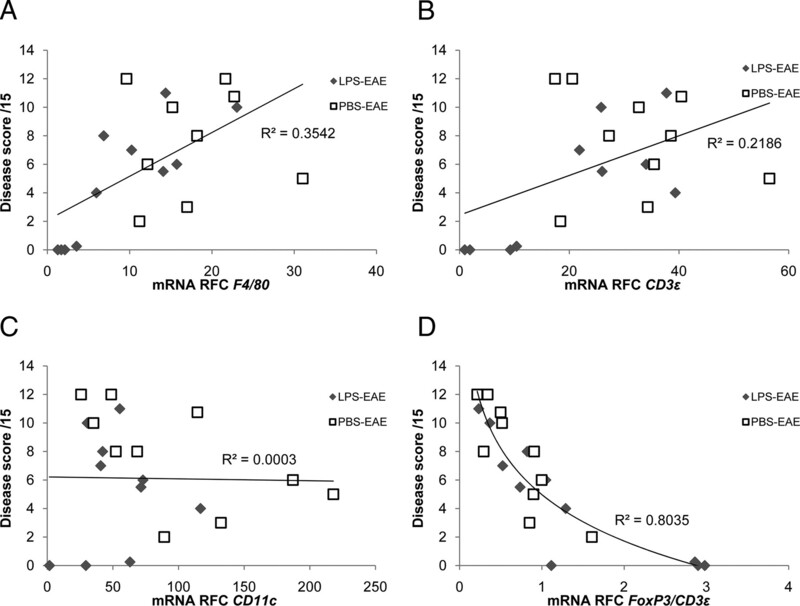 All PCR primers used herein are provided in supplemental Table I.5 All data were normalized to either HPRT or GAPDH mRNA levels and expressed as relative fold increases compared with controls ± SEM. Brain tissue (frontal white matter) was collected at autopsy from each experimental group (non-MS (Alzheimer disease, HIV, stroke), n = 11 and MS, n = 8) and stored at −80°C as described previously (19). Brain samples from controls were obtained from the Laboratory for Neurological Infection and Immunity Brain Bank (Edmonton, Alberta, Canada). Frontal white matter was homogenized and then lysed in TRIzol and used in real-time PCR analyses as described above. Human brain tissue sections from control and MS patients were provided by Dr. A. Clark (Department of Clinical Neurosciences, University of Calgary). Human brain sections were histologically stained with Luxol fast blue (LFB) and hematoxylin. To detect human leukocytes, anti-human CD45 (Zymed Laboratories) Abs were used in combination with anti-FoxP3 (1/100, 236A/E7; eBioscience) and anti-human CD3 Abs (Santa Cruz Biotechnology). Previously reported immunostaining protocols were performed for single and double labeling (22). For FoxP3 immunoblot analysis, mouse lumbar spinal cord tissue was completely homogenized in 1× Laemmli sample buffer containing 2-ME using the Fastprep-24 instrument and lysing matrix D (MP Biomedicals). Samples were boiled, subjected to SDS-PAGE on 12% polyacrylamide gels and transferred to nitrocellulose membranes (Hybond N; GE Healthcare). Membranes were blocked for 1 h with LI-COR Biosciences blocking buffer and incubated overnight at 4°C with anti-FoxP3 primary Ab (2 μg/ml, clone eBio7979; eBioscience) in LI-COR Biosciences blocking buffer plus 0.1% Tween 20. Primary Ab binding was detected with Alexa Fluor 680- conjugated goat anti-mouse secondary Ab (1/5000 dilution, 1 h; Invitrogen). Following each Ab incubation, three washes of 10 min each were performed in TBS plus 0.1% Tween 20. Blots were scanned and quantitated using a LI-COR Biosciences Odyssey infrared imaging system. For β-actin, blots were incubated with a HRP-labeled primary Ab (1/1000 dilution, sc-1616; Santa Cruz Biotechnology) for 1 h, washed, and developed using ECL substrate (Roche Diagnostics). β-Actin staining intensity was quantitated using the Quantity One software package (Bio-Rad). For determination of the statistical significance of differences in EAE scores, we used the Mann-Whitney U (two-tailed) test. Correlation analysis and linear or nonlinear regression analysis was performed using Microsoft Excel 2007. For all other statistical analyses, ANOVA or an unpaired Student’s t test (two tailed, unless otherwise indicated) were used. Although is it is widely recognized that acute intercurrent illnesses may influence the severity of autoimmune diseases (15), the impact of early life exposure to infectious agents or their products remains unclear. Using the described EAE model, a single neonatal exposure to LPS delayed the onset of EAE by 2 days, which was accompanied by a significant reduction in the severity of clinical scores thereafter as disease developed compared with the PBS-exposed controls (Fig. 1⇓A). The sum of disease scores up to day 14 following EAE induction was also significantly reduced in LPS-exposed animals (Fig. 1⇓B). Moreover, EAE animals that received PBS as neonates maintained greater neurobehavioral deficits for the duration of the study (30 days), as evidenced by significant increases in the maximal disease severity compared in the LPS-exposed animals with EAE (Fig. 1⇓C). In animals exposed to polyinosinic-polycytidylic acid (poly(I:C)) as neonates, the severity of EAE did not differ between PBS- vs poly(I:C)-exposed groups (data not shown). These studies suggested that a single neonatal exposure to LPS exerted a robust neuroprotective effect during EAE. Neurobehavioral scores in EAE. A, Mean behavioral scores following induction of EAE. EAE was delayed in onset and reduced in severity among neonatally LPS-exposed compared with PBS-exposed animals. B, Sum of scores over the first 14 days following induction of EAE showed a significant reduction in the LPS-exposed animals with EAE compared with the PBS exposed EAE animals. C, Maximum disease severity (MDS) over 30 days following induction of EAE again showing less severe disease in the LPS-exposed group. Solid bars represent the mean of the group. CTL, Controls. Student’s t test; ∗, p < 0.05 and ∗∗, p < 0.01. The induction of EAE is defined by both innate and adaptive immune responses within the CNS that involve resident as well as infiltrating cells (23). To determine the comparative expression of different cell-specific and inflammation-associated genes in the present model, their transcript abundance was assessed in spinal cords from PBS- and LPS-exposed animals with and without EAE. 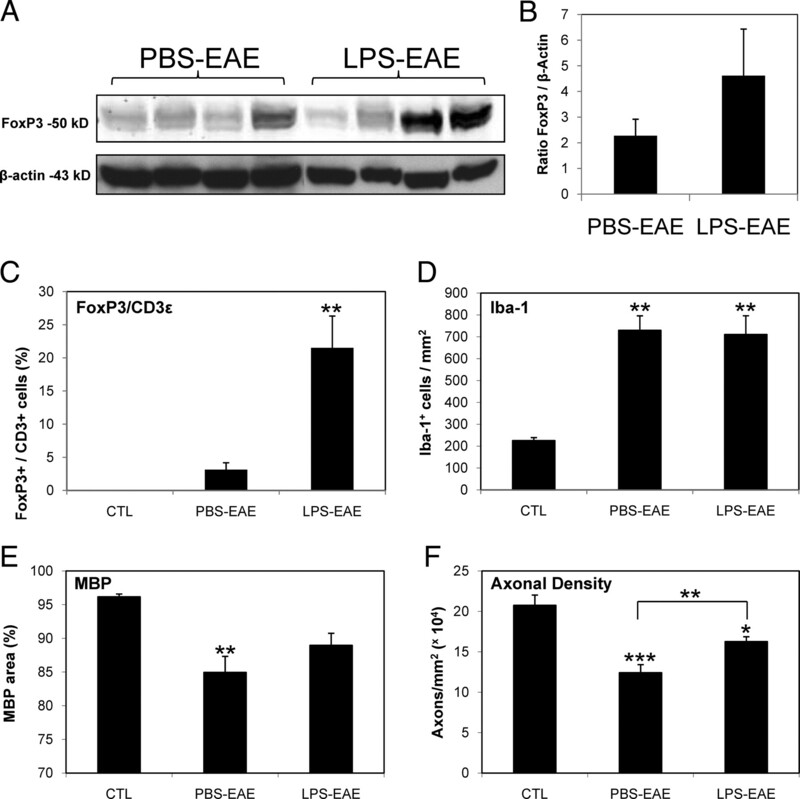 Expression of the macrophage/microglial activation marker F4/80 was increased in the EAE tissues relative to healthy animals’ tissues, although its expression in LPS-exposed animals with EAE was significantly less than that of PBS-exposed EAE animals (Fig. 2⇓A). TNF-α and IFN-γ transcript abundance was also increased in both EAE groups relative to healthy controls, with a trend toward higher expression in the PBS-exposed EAE animals (supplemental Fig. 1). CD3ε transcript levels, indicative of T cell infiltration, were increased in EAE animals, albeit with lower levels in the LPS-exposed EAE animals (Fig. 2⇓B). Likewise, CD11c transcripts were detectable in healthy animals’ spinal cords but their relative abundance was greatly increased in EAE animals, although significantly less so in the LPS-exposed EAE animals (Fig. 2⇓C). Of particular interest, IL-10 transcript levels were increased significantly in the LPS-exposed EAE animals relative to all other groups (Fig. 2⇓D), although IL-10 transcript levels were also increased in LPS-exposed animals relative to PBS-exposed animals without EAE. Transcript levels of the Treg-associated transcription factor FoxP3 (normalized to CD3ε) showed a trend toward being increased in the spinal cords of LPS- relative to PBS-exposed EAE-induced animals (Fig. 2⇓F), while no difference was seen in the expression of T-bet between EAE groups (Fig. 2⇓E). Taken together, these findings support the notion that neonatal LPS treatment might be protective in EAE by increasing the infiltration of Treg cells and the expression of immunoregulatory cytokines like IL-10 during CNS inflammation. Host immune responses in spinal cord. A, F4/80 transcript levels were increased in both EAE groups compared with controls (CTL) with significant increases in the PBS-exposed group. Similarly, CD3ε (B) and CD11c (C) transcript levels were also induced in both EAE groups, but more so in the PBS-exposed EAE group. D, IL-10 transcript levels were higher in the LPS-exposed EAE group, as well as LPS-exposed non-EAE group, compared with the corresponding controls. Although T-bet:CD3ε ratios did not differ between the PBS- and LPS-exposed EAE groups (E), FoxP3:CD3ε transcript ratios were increased in the LPS-exposed EAE group (F). RFC, Relative fold change ± SEM (n = 6 for all experimental groups; Student’s t test; ∗, p < 0.05 and ∗∗, p < 0.01). To understand the relationship between immune activation in the CNS and neurobehavioral outcomes, we examined the severity of neurobehavioral defects at day 14 in relation to host immune responses in the spinal cord at the same time point (Fig. 3⇓). There was a positive association between disease severity and relative abundance of F4/80 (r = 0.595, p < 0.01; Fig. 3⇓A) and CD3ε (r = 0.468, p < 0.05; Fig. 3⇓B) transcripts, but no association with the transcript levels of CD11c (r = −0.018; Fig. 3⇓C). Conversely, the level of FoxP3 (normalized to CD3ε) showed an inverse relationship with disease severity that was highly correlated (r = −0.836, p < 0.01; Fig. 3⇓D). These findings emphasized the close relationship between host neuroimmune response and neurological disease outcomes and indicate that the frequency of CNS-infiltrating Treg cells is likely an important determining factor in EAE severity. Correlation between spinal cord transcript levels and disease severity. Disease scores from animals sacrificed 14 days after EAE induction were compared with the transcript levels of various genes measured by real-time PCR in their lumbar spinal cords. Positive correlations were seen between disease severity and (A) F4/80 (p < 0.01, Pearson’s r = 0.5951, r2 = 0.3542), (B) CD3ε (p < 0.05, r = 0.4675, r2 = 0.2186), but not with (C) CD11c expression (r = −0.0179, r2 = 0.0003). D, An inverse correlation between FoxP3 (normalized to CD3ε) and disease severity was also evident (p < 0.01, r = −0.8355, r2 = 0.8035). RFC, Relative fold change. To determine how early life exposure to LPS affected T cell responses, splenocytes (Fig. 4⇓A) or spleen-derived CD11c+ DCs (Fig. 4⇓B) isolated from mice exposed to LPS or PBS as neonates were mitotically arrested and cocultured in the presence of MOG35–55 with splenocytes or purified splenic and inguinal lymph node T cells, respectively, from PBS-exposed mice with EAE. Splenocytes from PBS-exposed animals showed a more robust stimulation of T cell proliferation compared with splenocytes from LPS-exposed animals (Fig. 4⇓A). This effect was even more pronounced for DC:T cell cultures (Fig. 4⇓B) in that DCs from LPS-exposed animals stimulated significantly less T cell proliferation compared with DC from PBS-exposed animals (∼50%). These studies implied that the DC phenotype might manipulate the T cell response in this model. To explore the DC phenotype in more depth, we examined the expression of several molecules implicated in APC-T cell interactions. MHC II transcript levels were significantly reduced in DCs from LPS-exposed animals at 4 wk after LPS exposure (Fig. 4⇓C). Conversely, both CD80 and CD86 transcript levels were increased significantly in DCs from the LPS relative to the PBS-exposed animals (Fig. 4⇓C). Both SOCS-3, an inhibitor of STAT-mediated transcriptional activation, and IL-6 were found to be increased in DCs isolated from the LPS-exposed group (supplemental Fig. 2, A and B), while we saw no differences in the transcript levels of IL-10 or TGF-β1 in DCs from the two experimental groups (data not shown). To confirm these findings, corresponding protein levels were investigated by flow cytometric analysis of CD11c+ DCs harvested at 6 wk (Fig. 4⇓E) and 14 wk (14 days after EAE induction; Fig. 4⇓F). Like the transcript levels, mean MHC II immunoreactivity in CD11c+ cells was suppressed in the LPS-exposed animals at both time points while CD80 and CD86 displayed increased expression at each time point. Like MHC II, the DC differentiation marker CD83 was reduced in DCs from LPS-exposed animals at the transcript (supplemental Fig. 3A) and protein (supplemental Fig. 3B) level compared with PBS-exposed animals with EAE. Indeed, this distinguishing phenotype was also evident with repeated LPS stimulation at 4 h after exposure ex vivo. These results highlighted the impact of early life exposure to LPS on T cell proliferative responses and the phenotype or composition of the spleen CD11c+ compartment. 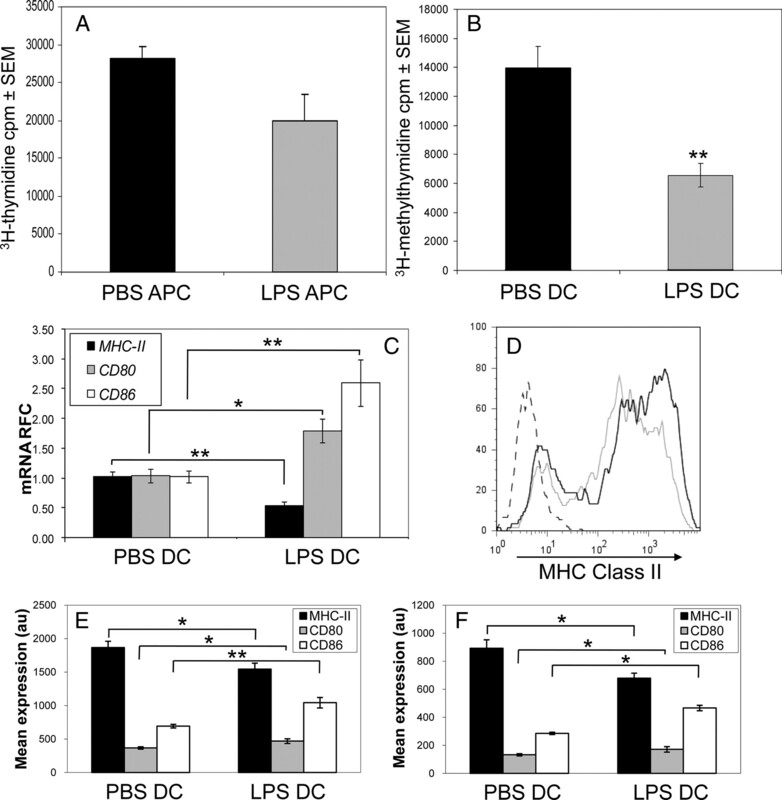 APC function and surface phenotype are altered by neonatal LPS exposure. A, Splenocytes from PBS-exposed animals were able to drive proliferation of responder cells (whole splenocytes) from PBS-exposed animals with EAE to a greater extent than splenocytes from LPS-exposed animals. Background cpm in control wells without MOG peptide were not significantly different between groups (∼7000 cpm). B, Similarly, CD11c+ DCs from PBS-exposed animals exhibited a greater capacity than DCs from LPS-exposed animals to induce proliferation of responder cells (purified T cells) from PBS-exposed EAE animals. Background cpm in control wells without MOG peptide were not significantly different between groups (∼15000 cpm). C, Transcript levels of MHC II were reduced, while CD80 and CD86 were increased in splenic CD11c+ cells isolated from LPS-exposed animals compared with PBS-exposed animals. D, Representative histogram overlay of MHC II expression in PBS-exposed (black) and LPS-exposed (gray) animals measured by flow cytometry. Dashed line indicates the unstained control. The total CD11c+ population contains a large MHC II-immunopositive population and a smaller immunonegative population. E, Flow cytometric measurements of mean MHC II, CD83, CD80, and CD86 levels in splenic CD11c+ cells from 6-wk-old PBS- or LPS-exposed animals showing reduced MHC II but increased CD80 and CD86 in the LPS-exposed group. F, Mean MHC II, CD80, and CD86 levels in splenic CD11c+ cells from 14-wk-old PBS- or LPS-exposed animals, 14 days after EAE induction again revealing reduced MHC II but increased CD80 and CD86 in the LPS-exposed group with EAE vs the PBS-exposed EAE animals. Background cpm values from cocultures with no MOG35–55 were subtracted for both proliferation assays (Student’s t test; ∗, p < 0.05 and ∗∗, p < 0.01). RFC, Relative fold change. Given the above findings of altered DC gene expression caused by early life exposure to LPS, the ensuing T cell phenotype generated by these cells was examined. Splenocytes (Fig. 5⇓, A–D) or DCs (Fig. 5⇓, E and F) from EAE-induced PBS- or LPS-exposed animals were isolated 14 days after EAE induction and cocultured with CFSE-labeled T cells derived from matched animals in the presence of MOG35–55 peptide. Flow cytometric analysis revealed that the percentage of CD4+ T cells expressing FoxP3 was greater after coculture with splenocytes (Fig. 5⇓A) and DCs (Fig. 5⇓E) from LPS-exposed animals compared with APCs from PBS-exposed animals regardless of the source of T cells. Likewise, when the analysis was restricted to proliferated (CFSElow) cells, the percentage that were CD4+FoxP3+ was increased in the splenocyte-containing cocultures from LPS-exposed animals (Fig. 5⇓C). There was no difference in the percentage of IFN-γ-expressing CD4+ T cells (total or proliferated) resulting from cocultures containing splenocytes from LPS- or PBS-exposed animals (data not shown). Although total and proliferated CD4+ T cells expressing IL-17A were reduced following coculture with splenocytes from LPS-exposed animals compared with splenocytes from PBS-exposed animals (Fig. 5⇓, B and D), there were no definitive differences in IL-17A expression among T cells cultured with DCs from either group (Fig. 5⇓F). Thus, not only did peripheral DC/APCs from LPS-exposed animals exhibit a unique phenotype, they also modulated the proportions of different CD4+ T cell lineages, notably enhancement of the FoxP3+ population. Phenotypic analysis of T lymphocytes following coculture of APCs with MOG. A, Coculture of splenocytes from PBS- or LPS-exposed EAE animals isolated at 14 wk of age (14 days after EAE induction) with T cells pooled from PBS-EAE animals (▪) or LPS-EAE animals (□). Total CD4+FoxP3+ T cells were increased in cocultures containing splenocytes from LPS-exposed EAE animals, and this effect was most evident when responder T cells were from LPS-exposed EAE animals. B, Conversely, total CD4+IL-17+ T cells were reduced in cocultures containing splenocytes from LPS-exposed EAE animals compared with PBS-exposed EAE animals. C, When responder T cells were labeled with CFSE and analysis was restricted to proliferated (CFSElow) cells, an increased proportion was CD4+FoxP3+ in cocultures containing splenocytes from LPS-exposed EAE animals as APCs. This effect was particularly pronounced when responder T cells were isolated from LPS-exposed EAE animals. D, Proliferated (CFSElow) CD4+IL-17+ T cells were less frequent in cocultures containing splenocytes from LPS-exposed EAE animals as APCs. E, CD11c+ cells (104) from PBS- or LPS-exposed animals were cocultured with T cells (105) pooled from NeoPBS-EAE or NeoLPS-EAE groups as in A. Total CD4+FoxP3+ T cells were present in greater abundance in cocultures with DCs from LPS-exposed animals. F, Total CD4+IL-17A+ T cell frequencies were variable among DC:T cell cocultures. A–D, One-tailed Student’s t test; E and F, two-tailed Student’s t test; ∗, p < 0.05 and ∗∗, p < 0.01. Because both MS and EAE are defined by neuroinflammation, demyelination, and axonal loss (23, 24), we examined the extent to which neonatal exposure to LPS influenced these parameters during EAE. Analysis of changes in microglia and macrophages revealed that Iba-1 immunoreactivity in age-matched control spinal cords without EAE (Fig. 6⇓A) was detected on ramified cells but in animals with EAE there was microglial hypertrophy and more frequently observed microglia and macrophages (Fig. 6⇓, B and C). CD3+ T cells were rarely seen in spinal cords from controls (Fig. 6⇓D) but in contrast, there were numerous CD3+ cells in both PBS (Fig. 6⇓E)- and LPS-exposed (Fig. 6⇓F) animals with EAE. The relative frequency of FoxP3+ cells in the spinal cord was minimal in controls (Fig. 6⇓G) but immunopositive T lymphocytes were detectable in EAE animals (Fig. 6⇓, H and I) and were especially numerous in LPS-exposed animals with EAE (Fig. 6⇓I). MBP immunoreactivity was abundant in control spinal cord white matter (Fig. 6⇓J) but was reduced in both PBS (Fig. 6⇓K)- and LPS-exposed (Fig. 6⇓L) animals with EAE. Silver-stained axons were highly abundant in spinal cords of controls (Fig. 6⇓M) but were diminished in PBS-exposed EAE animals (Fig. 6⇓N) and to a lesser extent in LPS-exposed animals (Fig. 6⇓O). Importantly, we observed no neuropathological differences between controls (without EAE) receiving PBS or LPS as neonates (data not shown). Neuropathological features of EAE with and without neonatal LPS exposure. A, Iba-1 immunoreactivity was present in control (CTL) animals but was markedly increased in PBS-exposed (B) and LPS-exposed animals with EAE (C). D, CD3 immunostaining was sparse in control animals, but highly abundant in PBS-exposed (E) and to a lesser extent LPS-exposed EAE animals (F). G, FoxP3-immunopositive cells were not detected in control animals but were detected at low levels in PBS-exposed EAE animals (H) and more abundantly in LPS-exposed EAE animals (I). J, MBP immunoreactivity was present in control animals but reduced in both PBS (K)- and LPS-exposed EAE animals (L). M, Silver-stained axons were observed in control animals but fewer were seen in PBS-exposed (N) and LPS-exposed EAE animals (O). Original magnification: A–L, ×200 and M–O, ×1000. To quantify the above morphological features in the spinal cords from each group, we performed an immunoblot analysis of FoxP3 in the lumbar spinal cords from PBS- or LPS-treated animals with EAE which showed increased FoxP3 immunoreactivity in spinal cords from LPS-treated animals with EAE (Fig. 7⇓A), which was also evident with graphic analysis (Fig. 7⇓B) and consistent with earlier findings. Immunopositive cells and histochemically stained axons were also counted disclosing that FoxP3-CD3ε immunoreactive cell numbers were increased in both EAE groups (Fig. 7⇓C), but there was a significant increase in the LPS-exposed group compared with PBS-exposed animals. Moreover, increased Iba-1 immunoreactivity was apparent in both EAE groups compared with controls without EAE (Fig. 7⇓D). MBP immunoreactivity was reduced in both EAE groups compared with controls without EAE, although this was significant in only the PBS-exposed animals with EAE (Fig. 7⇓E). Like the MBP reactivity, axonal counts were reduced in both groups of EAE-induced animals (Fig. 7⇓F) but the PBS-exposed EAE animals showed significantly fewer axons compared with LPS-exposed EAE animals. Thus, the neurobehavioral deficits were reflected in the corresponding neuropathology in that myelin and axonal loss with neuroinflammation was more evident in the neonatal PBS- vs the LPS-exposed animals with EAE, which was complemented by greater FoxP3-immunopositive cell infiltration. 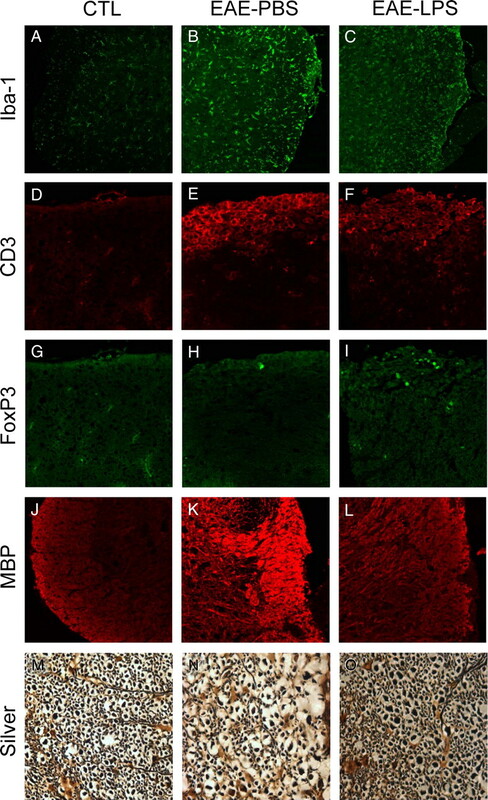 Quantitation of FoxP3 immunoreactivity and neural cell injury in EAE. A, Immunoblot analysis of FoxP3 and β-actin in lumbar spinal cords from neonatal PBS- or LPS-treated mice with EAE 14 days after EAE induction. B, Graphic analysis of immunoblot data disclosed an increase in FoxP3 immunoreactivity in spinal cords from LPS-exposed EAE animals. (Values are expressed as mean FoxP3 normalized to mean β-actin ± SEM, n = 4 animals/group.) 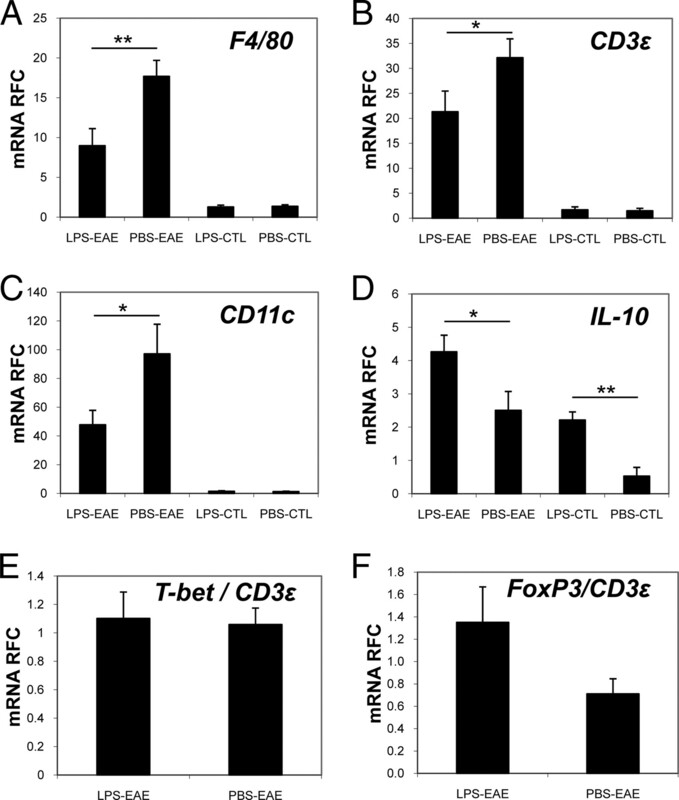 C, The number of FoxP3+/CD3ε cells was markedly increased in the LPS-exposed EAE group. D, Iba-1+ cells were increased in both EAE groups compared with controls (CTL). E, MBP immunoreactivity was reduced in both EAE groups, albeit more so in the PBS-exposed animals. F, Axonal fiber (silver staining) counts in lumbar spinal cords were reduced in both EAE groups, although the LPS-exposed group showed greater preservation of axons. Values are presented as mean ± SEM. Data represent five animals per group from one experiment (Tukey-Kramer multiple comparisons test; ∗, p < 0.05; ∗∗, p < 0.01; and ∗∗∗, p < 0.001). Given the present findings of up-regulation of FoxP3+ lymphocytes in the spinal cords of animals neonatally exposed to LPS along with earlier studies indicating a paucity of Treg cells in the CNS of MS patients (25), we examined normal-appearing white matter from non-MS patients with and without concurrent neuroinflammatory disorders (Fig. 8⇓A), which disclosed abundant LFB and hematoxylin staining compared with brain sections from MS patients (Fig. 8⇓B) which showed loss of LFB staining, indicative of demyelination. CD45 immunoreactivity was limited to perivascular cells with occasional microglia in the non-MS patients (Fig. 8⇓C) while the MS-derived sections exhibited numerous round immunopositive cells, resembling lymphocytes, in regions of demyelination (Fig. 8⇓D). FoxP3-positive cellular nuclei were identified in the brains of (inflamed) non-MS patients (Fig. 8⇓E) and were largely in CD3-immunopositive cells (Fig. 8⇓E, inset: CD3, blue and FoxP3, brown) while FoxP3 immunoreactivity was sparse in MS brains including in regions of demyelination (Fig. 8⇓F). To extend these observations, we examined the expression of genes highlighted earlier, revealing that CD3ε transcript levels were significantly higher in MS brains compared with non-MS patients (Fig. 8⇓G) and, similarly, both HLA-DRA and -DQA1 transcript levels showed a trend toward increased levels in MS patients (Fig. 8⇓H). CD11c transcript levels did not differ substantially between MS and non-MS brains (Fig. 8⇓I) but the ratios of FoxP3:CD3ε were significantly higher in the non-MS patient brains (Fig. 8⇓J). These latter findings serve to emphasize the potential impact of Treg cells on neuroinflammation and disease outcomes in MS.
FoxP3 expression in the human CNS. A, Normal-appearing white matter from non-MS patients disclosed LFB and hematoxylin staining but brain sections from MS patients showed loss of LFB staining (B). C, CD45 immunoreactivity was observed in perivascular cells (arrow) with occasional microglia in the non-MS patients (D) while the MS brains exhibited numerous round immunopositive cells (arrow) in regions of demyelination. 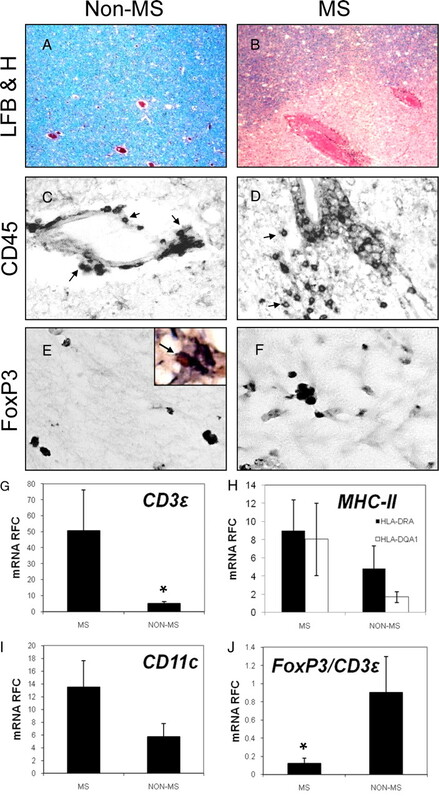 E, FoxP3-positive cellular nuclei were identified in the brains of non-MS patients and were present in CD3-immunopositive cells (Fig. 8E, inset: CD3, blue and Foxp3, brown, arrow), although) FoxP3 immunoreactivity was infrequent in MS brains (F). Original magnification: A and B, ×40; C and D, ×200; and E and F, ×400. G, CD3ε transcript levels were higher in MS brains compared with non-MS patients and H, both HLA-DRA and -DRQA1 expression was higher in MS patient brains. I, CD11c transcript levels did not differ between MS and non-MS brains; J, however, the ratios of FoxP3:CD3ε were higher in the non-MS patient brains (Mann-Whitney U test; ∗, p < 0.05). Immune perturbations are well known to influence the course of autoimmune diseases, frequently with adverse outcomes (15). In the present study, a single exposure of LPS, but not poly(I:C), to neonatal mice reduced the severity of neurobehavioral and neuropathological disease after the induction of EAE. In fact, the extent of EAE-induced neuroinflammation was diminished in the CNS of LPS-exposed animals, which was associated with up-regulation of IL-10. DCs from LPS-exposed animals displayed a distinct phenotype with suppressed MHC II and CD83 expression, although CD80 and CD86 were concurrently induced. This APC phenotype was associated with enhanced Treg cell expansion, which was also evident in the spinal cords of LPS-exposed EAE animals. Moreover, the Treg marker FoxP3 exhibited reduced expression in the brains of MS patients. These observations suggest that early life exposure to select immunogens can exert robust and sustained effects on innate-adaptive immune systems interactions (Fig. 9⇓), leading to altered disease courses. Events leading to LPS-mediated neuroprotection in EAE. Early life exposure to saline only (red line) or LPS (green jagged line) influences the relative activation of MOG35–55 (MOG peptide)-specific naive T cells in the lymph node. Neonatal LPS exposure induces surface phenotype changes in APCs, including lower surface MHC II + MOG peptide and higher CD80/CD86 costimulatory molecules, which determines the balance between the generation of Teff cell responses (red) and Treg cell responses (green). Upon migration of these T cells across the blood-brain barrier into the CNS, the relative proportion of Teff and Treg define and regulate the extent of neuroinflammation and resulting damage to oligodendrocytes and axons. The impact of LPS on EAE is variable depending on the timing of administration. A recent study suggested that LPS exposure 3 days before EAE induction delays the onset of disease without affecting the peak severity (26), while earlier reports describe an induction of relapses of EAE when LPS was included in the experimental protocol (27) or have even substituted LPS in place of heat-killed Mycobacterium tuberculosis as an adjuvant in the EAE induction protocol (28). Indeed, we have noted that exposure to LPS (1 mg/kg) 3 days after EAE induction was lethal in 100% of animals (data not shown). These findings underscore the variable outcomes of autoimmune disease, depending on environmental determinants. Several groups have shown that axonal injury and loss are key determinants of the neurological disability observed in patients with MS and also the neurobehavioral features associated with EAE (23, 24). In the present model, protection mediated by neonatal LPS exposure was characterized by a reduction of CNS inflammation and axonal loss, which is likely a consequence of several factors. The number of T cells infiltrating the CNS was positively correlated with disease severity and in the LPS-exposed EAE groups we found that fewer T cells entered the CNS based on CD3ε transcript levels. In addition, we found evidence that the frequency of FoxP3+ cells in the CNS, relative to the number of infiltrating T cells (CD3+), was increased in the LPS-protected animals. Importantly, of all markers we examined, disease severity correlated most strongly (and inversely) with transcript levels of FoxP3 (normalized to CD3ε) in the CNS, which is not merely explained by increased CD3ε levels but indicates that Treg cells likely play a key role in reducing neuroinflammation during EAE. This finding is in apparent contradiction with a previous study suggesting that CNS-infiltrating Teff isolated at the peak of EAE are resistant to suppression by Treg (29), although this finding was predicated on ex vivo suppression assays, which may not recapitulate in vivo events in the CNS. In support of our findings, it has recently been shown that adoptive transfer of Treg cells can prevent the development of EAE, with a critical role for IL-10 highlighted by the lack of protection afforded by IL-10−/− Treg (30). It is clear that induction of EAE causes an up-regulation of IL-10 in the spinal cord compared with controls, which likely represents a natural feedback-inhibition mechanism for inflammation. Indeed, in our model, we noted increased IL-10 expression in the spinal cords of LPS-exposed EAE animals compared with PBS-exposed EAE animals, which exhibited higher EAE scores. In fact, when we analyzed host immune gene transcript levels in the spinal cords of PBS- and LPS-exposed animals without EAE, IL-10 was the only gene found to differ significantly in expression levels between the two groups, with higher expression levels in the lumbar spinal cords of LPS-exposed animals even 12 wk after treatment (Fig. 2⇑D). This observation implies that early up-regulation in the CNS of negative feedback regulators of immune responses might be partially responsible for the protection afforded by LPS treatment in our model. It is also conceivable that resident microglia or other cells in the CNS may have been made less responsive to danger signals by neonatal LPS treatment, resulting in reduced proinflammatory cytokine production in response to danger signals elicited by the pathogenic actions of infiltrating MOG-specific T lymphocytes. This possibility will be important to explore in future studies. 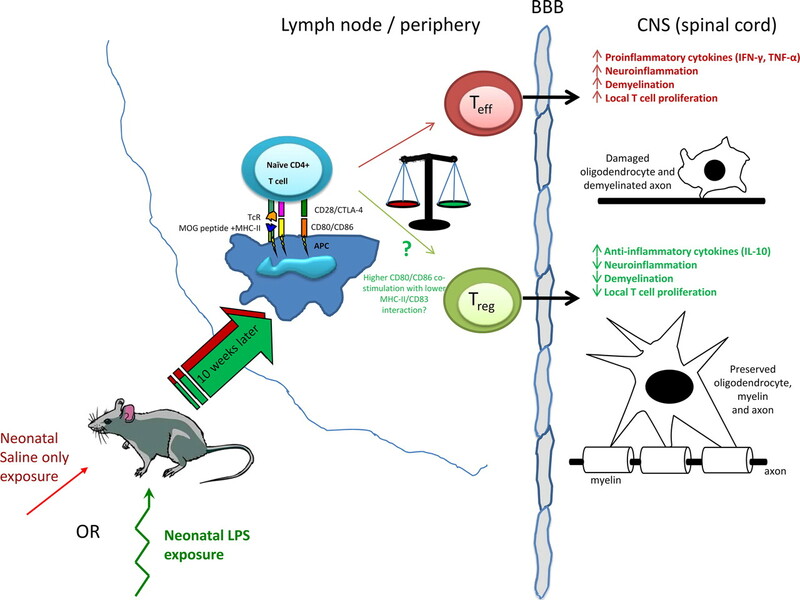 Immunomodulatory effects of early life LPS exposure were also evident outside of the CNS. Splenic APCs from LPS-exposed animals induced less T cell proliferation and higher percentages of CD4+FoxP3+ T cells in response to MOG35–55 in vitro. These findings were associated with a distinctive molecular profile in the spleen CD11c+ compartment defined by reduced MHC II with increased CD80 and CD86 expression that was apparent at both 6 wk of age and during EAE (Fig. 4⇑). Low MHC II on DCs might reduce the strength of the activation signal provided to a T cell at the immune synapse (14). Analysis of the DC differentiation marker CD83, however, showed significantly higher levels on resting splenic CD11c+ cells isolated from PBS- compared with LPS-exposed animals (supplemental Fig. 3), implying that DCs from LPS-exposed animals were less mature in keeping with reduced MHC II expression on the same cells. Although higher levels of CD86 on LPS-exposed DCs might seem incompatible with an increase in tolerogenicity, interactions with its alternate receptor CTLA-4 are known to provide a negative signal to T cells (14). Furthermore, DCs isolated from MS patients have been shown to be deficient in expression of CD86 compared with controls (31). Although we did not examine their expression in this study, other B7 family members (e.g., ICOS-L, PD-L1, PD-L2) may underlie the tolerogenic properties of the DCs from LPS-treated animals and this should be examined in future work. Because we analyzed mean expression of these markers in the total CD11c+ population, it is conceivable that the phenotypic and functional differences seen were the result of expansion or contraction of particular CD11c+ subtypes that we did not quantify, e.g., plasmacytoid DCs (B220+Gr1+) or NK-like cells (B220+NK1.1+) (32). It is also interesting to note that in rats, splenic plasmacytoid DC activated by TLR7 and TLR9 agonists strongly induced Treg expansion, and this effect could be partially blocked by Abs against CD86 (33). Another intriguing aspect of these studies is that although LPS is known to act through TLR4, the preparation used in these studies frequently contains bacterial RNA, which could potentially serve as a ligand for TLR7 and TLR8 (34, 35, 36). In any case, the apparently enhanced Treg induction capacity shown by APC from LPS-exposed animals coincides with the reduced disease severity and increased FoxP3+ T cell frequencies seen in their spinal cords during EAE. Among autoimmune diseases, the initiating events for the disease process remain unclear although both genetic predisposition and environmental factors are implicated (37). Although speculative, if there is a threshold for activation by innate immune stimuli that might be altered by prior exposure to danger-associated patterns, it is conceivable that in the case of spontaneous autoimmune disease the protection afforded would be complete by preventing the immune system from reacting to whatever danger signal is aberrantly activating it at the outset. The present model using an immunization with CFA adjuvant and high quantities of MOG peptide is contrived and designed to induce severe (and measurable) disease. If the activating factor(s) in MS is, for example, residual microbial patterns from a prior nervous system infection or danger signals elicited by necrosis of damaged or dying cells, then it is feasible that an activation threshold set higher by early life events, perhaps through induction of IL-10 or other anti-inflammatory genes, might have a protective consequence. This speculative concept of a higher innate immune-activating threshold could be explored further in a more spontaneous autoimmune disease model and also by amplifying the initial signals in future studies. Recent studies indicated that FoxP3+ lymphocytes were less frequently observed in the CNS of MS patients (25); the present findings extend these studies by showing that FoxP3 transcript abundance is also significantly lower in MS brains despite greater infiltration by CD3-expressing lymphocytes. Although in humans FoxP3 may be present in certain other cell types (38), our observations in human brain tissue are compatible with our finding that the frequency of Treg cells in the spinal cords of EAE animals inversely correlates with disease severity. These findings also raise the possibility that Treg cells might have neuroprotective properties, either by modulating Teff cells directed toward target cells including oligodendendrocytes and axons or through down-regulation or reprogramming of myeloid cells (macrophages or microglia) to a less pathogenic phenotype (39). In fact, the current EAE model is a short-term duration model yet the axonal density was comparatively reduced in the PBS-exposed animals, suggesting it is highly plausible that FoxP3+ lymphocytes might exert cytoprotective effects on target cells, likely involving IL-10. An intriguing possibility is that perhaps damage to target cells results in diminished intra-CNS conversion of Treg cells from encephalitogenic Teff cells, as recently suggested for EAE (40). The current findings provide new insights into the cross-talk between innate and adaptive immunity with respect to the balance between immune tolerance and activation and lend support to the notion of early life exposure to microbial products as a potential immune modulator. Diseases caused by aberrant immune responses might involve not only a failure of prior exposures to skew T cell responses toward a nonpathogenic Teff cell phenotype (i.e., TH1 to TH2), but also a defect in the balance between regulatory and effector T cell responses in general. Strategies to simulate evolutionarily “normal” exposures to pathogen-associated molecular patterns, particularly early in life, might protect against future atopic disease and autoimmunity. Further elucidation of the detailed mechanisms by which early life exposures act to set the balance between tolerance and immunity might also provide new targets for therapies to treat MS and other disorders of immune regulation. We thank Drs. Fabrizio Giuliani, Sean Ellis, and Babita Agrawal for helpful discussions and Leah DeBlock for assistance with manuscript preparation. ↵1 These studies were supported by the Multiple Sclerosis Society of Canada and the NeuroScience Canada Foundation. S.T. is a Multiple Sclerosis Society of Canada Fellow. F.N. is an Alberta Heritage Foundation for Medical Research Fellow. V.W.Y. is an Alberta Heritage Foundation for Medical Research Medical Scientist and holds a Canada Research Chair in Neuroimmunology. Q.J.P. is an Alberta Heritage Foundation for Medical Research Medical Scientist. C.P. is an Alberta Heritage Foundation for Medical Research Senior Scholar and holds a Canada Research Chair in Neurological Infection and Immunity. ↵2 K.K.E. and S.T. contributed equally to this work. ↵4 Abbreviations used in this paper: MS, multiple sclerosis; EAE, experimental autoimmune encephalomyelitis; MBP, myelin basic protein; Treg, regulatory T; Teff, effector T; DC, dendritic cell; MOG, myelin oligodendrocyte glycoprotein; MHC II, MHC class II; LFB, Luxol fast blue; poly(I:C), polyinosinic-polycytidylic acid. Strachan, D. P.. 1989. Hay fever, hygiene, and household size. Br. Med. J. 299: 1259-1260. Leibowitz, U., A. Antonovsky, J. M. Medalie, H. A. Smith, L. Halpern, M. Alter. 1966. Epidemiological study of multiple sclerosis in Israel: II. Multiple sclerosis and level of sanitation. J. Neurol. Neurosurg. Psychiatry. 29: 60-68. Correale, J., M. Farez. 2007. Association between parasite infection and immune responses in multiple sclerosis. Ann. Neurol. 61: 97-108. La Flamme, A. C., K. Ruddenklau, B. T. Backstrom. 2003. Schistosomiasis decreases central nervous system inflammation and alters the progression of experimental autoimmune encephalomyelitis. Infect. Immun. 71: 4996-5004. Sewell, D., Z. Qing, E. Reinke, D. Elliot, J. Weinstock, M. Sandor, Z. Fabry. 2003. 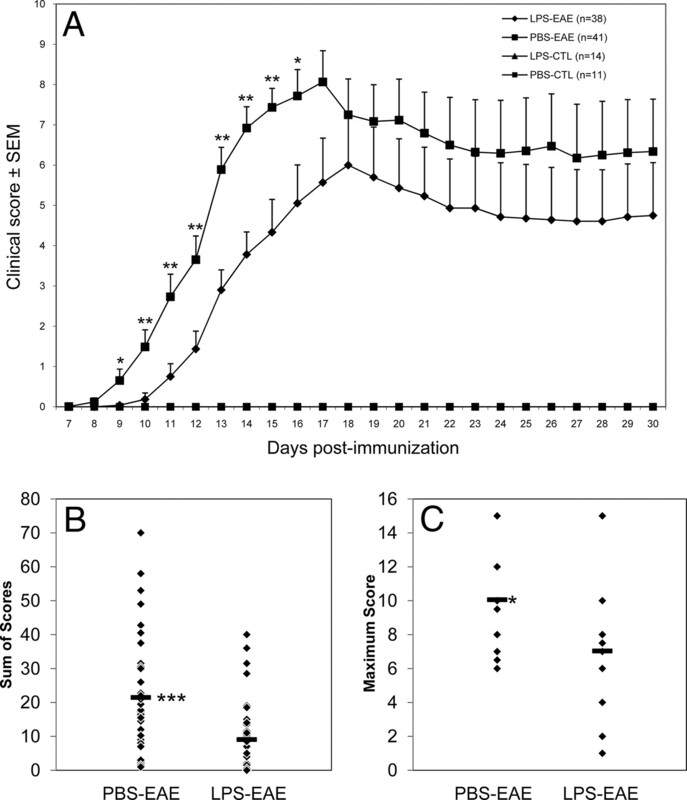 Immunomodulation of experimental autoimmune encephalomyelitis by helminth ova immunization. Int. Immunol. 15: 59-69. Gruden-Movsesijan, A., N. Ilic, M. Mostarica-Stojkovic, S. Stosic-Grujicic, M. Milic, L. Sofronic-Milosavljevic. 2008. Trichinella spiralis: modulation of experimental autoimmune encephalomyelitis in DA rats. Exp. Parasitol. 118: 641-647. Zorzella, S. F., J. Seger, D. R. Martins, A. C. Pelizon, A. Sartori. 2007. Resistance to experimental autoimmune encephalomyelitis development in Lewis rats from a conventional animal facility. Mem. Inst. Oswaldo Cruz 102: 931-936. Goverman, J., A. Woods, L. Larson, L. P. Weiner, L. Hood, D. M. Zaller. 1993. Transgenic mice that express a myelin basic protein-specific T cell receptor develop spontaneous autoimmunity. Cell 72: 551-560. Anderton, S. M., R. S. Liblau. 2008. Regulatory T cells in the control of inflammatory demyelinating diseases of the central nervous system. Curr. Opin. Neurol. 21: 248-254. Paul, W. E.. 2003. Fundamental Immunology 5th Ed.497-517. Lippincott Williams & Wilkins, Philadelphia. Romagnani, S.. 2006. Regulation of the T cell response. Clin. Exp. Allergy 36: 1357-1366. Kamradt, T., R. Goggel, K. J. Erb. 2005. Induction, exacerbation and inhibition of allergic and autoimmune diseases by infection. Trends Immunol. 26: 260-267. Cabre, P.. 2007. Migration and multiple sclerosis: the French West Indies experience. J. Neurol. Sci. 262: 117-121. Spencer, S. J., S. Martin, A. Mouihate, Q. J. Pittman. 2006. Early-life immune challenge: defining a critical window for effects on adult responses to immune challenge. Neuropsychopharmacology 31: 1910-1918. Noorbakhsh, F., S. Tsutsui, N. Vergnolle, L. A. Boven, N. Shariat, M. Vodjgani, K. G. Warren, P. Andrade-Gordon, M. D. Hollenberg, C. Power. 2006. Proteinase-activated receptor 2 modulates neuroinflammation in experimental autoimmune encephalomyelitis and multiple sclerosis. J. Exp. Med. 203: 425-435. Tsutsui, S., J. Schnermann, F. Noorbakhsh, S. Henry, V. W. Yong, B. W. Winston, K. Warren, C. Power. 2004. A1 adenosine receptor upregulation and activation attenuates neuroinflammation and demyelination in a model of multiple sclerosis. J. Neurosci. 24: 1521-1529. Giuliani, F., L. M. Metz, T. Wilson, Y. Fan, A. Bar-Or, V. W. Yong. 2005. Additive effect of the combination of glatiramer acetate and minocycline in a model of MS. J. Neuroimmunol. 158: 213-221. Tsutsui, S., F. Noorbakhsh, A. Sullivan, A. J. Henderson, K. Warren, K. Toney-Earley, S. E. Waltz, C. Power. 2005. RON-regulated innate immunity is protective in an animal model of multiple sclerosis. Ann. Neurol. 57: 883-895. Power, C., P. A. Kong, T. O. Crawford, S. Wesselingh, J. D. Glass, J. C. McArthur, B. D. Trapp. 1993. Cerebral white matter changes in acquired immunodeficiency syndrome dementia: alterations of the blood-brain barrier. Ann. Neurol. 34: 339-350. Sospedra, M., R. Martin. 2005. Immunology of multiple sclerosis. Annu. Rev. Immunol. 23: 683-747. Trapp, B. D., J. Peterson, R. M. Ransohoff, R. Rudick, S. Mork, L. Bo. 1998. Axonal transection in the lesions of multiple sclerosis. N. Engl. J. Med. 338: 278-285. Nogai, A., V. Siffrin, K. Bonhagen, C. F. Pfueller, T. Hohnstein, R. Volkmer-Engert, W. Bruck, C. Stadelmann, T. Kamradt. 2005. Lipopolysaccharide injection induces relapses of experimental autoimmune encephalomyelitis in nontransgenic mice via bystander activation of autoreactive CD4+ cells. J. Immunol. 175: 959-966. Hansen, B. S., R. Z. Hussain, A. E. Lovett-Racke, J. A. Thomas, M. K. Racke. 2006. Multiple Toll-like receptor agonists act as potent adjuvants in the induction of autoimmunity. J. Neuroimmunol. 172: 94-103. Korn, T., J. Reddy, W. Gao, E. Bettelli, A. Awasthi, T. R. Petersen, B. T. Backstrom, R. A. Sobel, K. W. Wucherpfennig, T. B. Strom, M. Oukka, V. K. Kuchroo. 2007. Myelin-specific regulatory T cells accumulate in the CNS but fail to control autoimmune inflammation. Nat. Med. 13: 423-431. Selvaraj, R. K., T. L. Geiger. 2008. Mitigation of experimental allergic encephalomyelitis by TGF-β induced Foxp3+ regulatory T lymphocytes through the induction of anergy and infectious tolerance. J. Immunol. 180: 2830-2838. Huang, Y. M., M. Kouwenhoven, Y. P. Jin, R. Press, W. X. Huang, H. Link. 2001. Dendritic cells derived from patients with multiple sclerosis show high CD1a and low CD86 expression. Mult. Scler. 7: 95-99. Blasius, A. L., W. Barchet, M. Cella, M. Colonna. 2007. Development and function of murine B220+CD11c+NK1.1+ cells identify them as a subset of NK cells. J. Exp. Med. 204: 2561-2568. Ouabed, A., F. X. Hubert, D. Chabannes, L. Gautreau, M. Heslan, R. Josien. 2008. 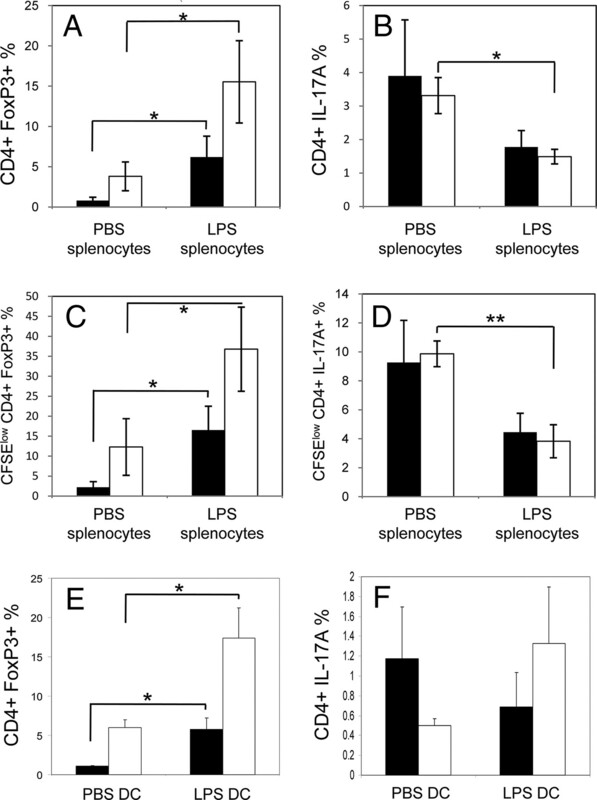 Differential control of T regulatory cell proliferation and suppressive activity by mature plasmacytoid versus conventional spleen dendritic cells. J. Immunol. 180: 5862-5870. Koski, G. K., K. Kariko, S. Xu, D. Weissman, P. A. Cohen, B. J. Czerniecki. 2004. Cutting edge: innate immune system discriminates between RNA containing bacterial versus eukaryotic structural features that prime for high-level IL-12 secretion by dendritic cells. J. Immunol. 172: 3989-3993. Giovannoni, G., G. Ebers. 2007. Multiple sclerosis: the environment and causation. Curr. Opin. Neurol. 20: 261-268. Gavin, M. A., T. R. Torgerson, E. Houston, P. DeRoos, W. Y. Ho, A. Stray-Pedersen, E. L. Ocheltree, P. D. Greenberg, H. D. Ochs, A. Y. Rudensky. 2006. Single-cell analysis of normal and FOXP3-mutant human T cells: FOXP3 expression without regulatory T cell development. Proc. Natl. Acad. Sci. USA 103: 6659-6664. Weber, M. S., T. Prod'homme, S. Youssef, S. E. Dunn, C. D. Rundle, L. Lee, J. C. Patarroyo, O. Stuve, R. A. Sobel, L. Steinman, S. S. Zamvil. 2007. Type II monocytes modulate T cell-mediated central nervous system autoimmune disease. Nat. Med. 13: 935-943. Liu, Y., I. Teige, B. Birnir, S. Issazadeh-Navikas. 2006. Neuron-mediated generation of regulatory T cells from encephalitogenic T cells suppresses EAE. Nat. Med. 12: 518-525.